There is a very small temple located exactly behind the Panchamukhi Pranadevaru temple in Gandhal. Gandhal is a small village in Raichur district of Karnataka and it is famous for the Hanuman or Prabnadevaru Temple. The Pranadevaru Temple is closely connected with Ramayana. Legend has it that Hanuman sought the help of Vibheeshana to locate Rama and Lakshmana who had been kidnapped by Mahiravana, the brother of Ravana. Mahiravana had hidden Rama and Lakshmana in his kingdom of Patala. Vibheeeshana told Hanuman that the only way to Patala was either through the palace of Ravana in Lanka or through a cave in Dandakaranya which was guarded by a Goddess called Yerukalamba. Hanuman knew that entering Ravana’s palace in Lanka and finding the way to Patala was next to impossible. So the only choice was to go through the cave. Hanuman then came to Gandhal and sought the help of Yerukalamba to enter Patala loka. The Goddess advised Hanuman to seek out Chandrasena, who was an ardent devotee of Rama. Hanuman then approached Chandrasena and told him about Rama and Lakshmana and their kidnap. Chandrasena told Hanuman about the secret of Mahiravana’s life and also the manner in which he could kill the demon king of Patala. Hanuman rescued both Rama and Lakshmana from Patala Loka. He then thanked the Goddess and told her that this place would forever be known as Panchamukhi and that she would be here to guard it. Therefore, the temple of Yerukalamba stands behind the Panchamukhi temple, standing sentinel to the area. Yerukalamba is another name for Padmavathi. She is the village deity of Gandhal and several other villages in Raichur district. Raghavendra Swamy visited the temple several times and prayed to the Goddess. Visit this temple after you go to the Panchamukhi Pranadevaru Temple. The Goddess is believed to be a powerful one. It is significant that if it is Manchalamma in Mantralaya, it is Yerukalamba in Panchamukhi. Raichur is very near from this place and in case you are going back to Bangalore you can take the Raichur route. However, this route is 80 kms more than the Gutti-Ananthapur-Penukonda route to Bangalore. However, if you take the Raichur route you can visit Manvi, Anegundi, Navabrindavana, Hampi and motor down to Bangalore via Hospet and Chitradurga. This is one of the most powerful strotas to keep away evil forced and provide a Kavacha or armour of protection. It is known as the Panchimukhi stotra and you can get more details from the priest of the Panchamukhi Pranadevaru temple in Gandhal, Raichur. It is generally believed that this strotra keeps a devotee in god physical and mental health. By the way, the five forms namely Hanuman, Narasimha, Garuda, Varaha, and Hayagriva can also be invoked individually. This is small village steeped in legends. Though it is near Mantralaya, it is in Karnataka However, for miles around there is not a sign board or poster leading us to the village. The first mention of the village is from the passenger autos and small maxi cabs whose drivers yell out Bichale and Panchamukhi. The next you see or hear about them is when you reach the Madhavaram Cross. While one of the rads lead to Manyralaya, the right from Mantralaya leads to Panchamukhi. The next prominent sign is when you reach Chiksugur cross. If you take the left you reach Bichale and the right leads you to Panchamukhi. The name of the village in which the Panchamukhi temple is situated is Gandhal. It is in Raichur district of Karnataka State. The road to Gandhal is in a deplorable state and it is best you make the journey during day time. There are numerous potholes and the road is very narrow at times. The road passes by some small villages and there is no sign or post indicating the temple. It is only when you continue on the narrow, dusty road, you realise that the temple is right ahead. The temple is steeped in history and mystery. The priests here tell you that the idol has its origin in our first epic-the Ramayana. Ravana took the help of Mahiravana, king of Patala or Patalapuri, during his war with Rama. Mahiravana, the rother of Ravana, decided to kindpa Rama and Lakshmana to his Patala Loka. When Hanuman realised what was about to happen, he formed a huge fortress with his tail and requested Rama and Lakshmana to sit inside. Hanuman did not allow anyone to entre the “tail” fort. Mahiravana took the form of Vibheeshana and entered the fort. Once inside, he quickly took Rama and Lakshman to Patala Loka. When Hanuman realised that he had been tricked, he reduced himself in size and entered Pathala. He was told that he had to kill Mahiravana if he had to safely bring out Rama and Lakshmam from Pathala. This could be achieved only if he extinguished five lamps. Hanuman then hit upon the idea of taking five forms and blowing out the fire in the lamps. He thus took on the Panchamukha form of Hanuman, Hayagriva, Narasimha, Garuda and Varaha. Among the Panchamukhis, Varaha faces north, Narasimha the south, Garuda west, Hayagriva the sky and Hanuman the east. Anopther significance of the five or pancha elements here is that Hanuman is the son of son of Vayu or wind. He crossed the Indian Ocean-another element-water, through another element-Sky to meet with the daughter of Earth-Seetha and burnt down Lanka by fire-another element. Here, Hanuman faced another problem. The gates of Patala were guarded by Makaradhwaja, a part reptile and part Vanara. Makardhwaja was born from Hanuman’s sweat. When Hanuman extinguished his burning tail in the Indian ocean, a drop of his sweat fell into the waters, which eventually became Makardhwaja. When Hanuman introduces himself, Makaradwaja calls himself the son of Hanuman. He then asks for the blessings of Hanuman and says he has to fight on the side of Mahiravana. A fierce fight takes place and it seems that Makaradhwaja is equal to Hanuman in valour and bravery. Finally, Hanuman manages to defeats and imprison his son and gains entry onto Patala. He extinguished the fire in the lamps, kills Maharavana and brings back Rama and Lakshmana to safety of the earth. According to Hanumath Prakaranam in Sri Vidyarnavatantram, Anjaneya has five faces (Pancha Mukha) and ten weapons. He uses all of them, against Mahiravana. Later, he frees Makaradhwaja and on the advice of Rama, crown him king of Patala. Another reason why this place is holy is that Raghavendra Swamy sat in meditation here for 12 years and he had the darshan of several Gods. Hanuman appeared as the panchamukhi before Raghavendra Swamy here amalgamating within himself the avatars of Varaha, Garuda, Anjaneya, Narasimha and Hayagreeva. 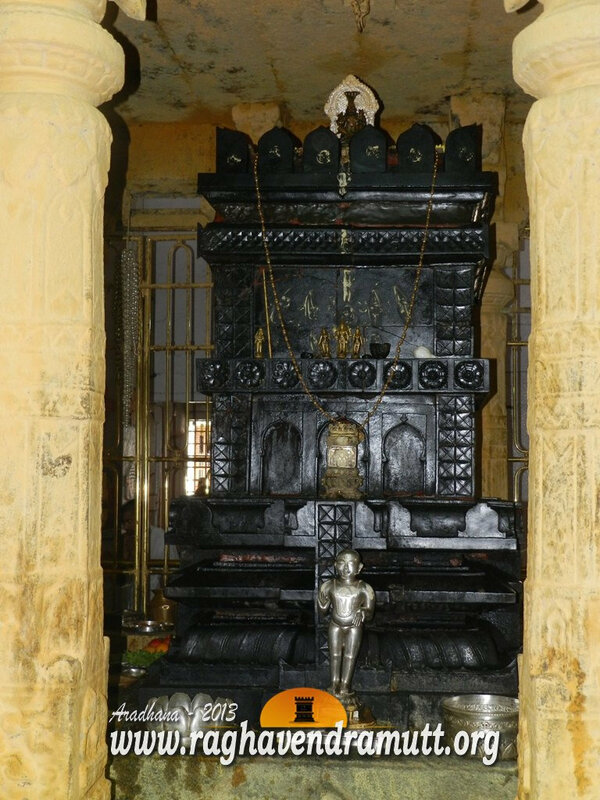 The Srinivasa of Tirupathi, his consort the Mahalakshmi of Kolhapur and the Kurma Avatar of Vishu appeared before Raghavendra in the cave where the idol of Panchamukhi Hanuman is located. This idol is supposed to be very powerful and it gives devotes whatever they ask. As per the Puranas, The east facing Anjaneya grants Ishta Siddhi, south facing Narasimha gives Abhista Siddhi, west facing Garuda grants sakala sowbhagya, north facing Mah Lakshmi provides dhana or wealth and Hayagriva grants Sarvavidya.. It is only after Raghavendra Swamy had the darshan of these Gods and Anjaneya that he left for Mantralaya and entered Brindavana there in 1671. The temple is open from 7 a.m., to 8 p.m. Gandhal is just 20 kms from Mantralaya.